Brutus, NY (December 17, 2018) – The death of a man that occurred while he was working has police investigating the nature of the incident. Police responded to a call on Friday morning, December 14, concerning a man who was killed in an accident with a tractor in the town of Brutus, according to officials. The man was reported to have been killed while operating a tractor at 9475 Oakland Road. The tractor overturned at some point due to reasons that are still being determined. 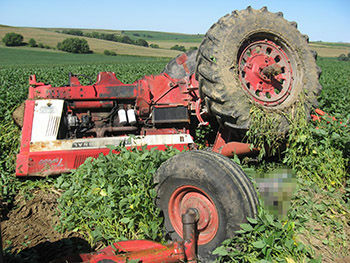 At this time, it is not clear as to how the tractor overturned and whether or not malfunctioning equipment, another party, a medical episode, or another reason are to blame. Emergency medical personnel tragically pronounced the victim deceased at the scene shortly after their arrival. The identity of the victim is being withheld pending notification of kin. Accidents while working occur all-too-often, particular while engaged in duties that include the use of heavy machinery. First and foremost, our deepest sympathies and warmest thoughts and prayers are extended to the loved ones of the victim during this tragic time. Workplace accidents in New York are frequently deadly, and while it can be terribly difficult, it is essential to understand that you may have significant rights following an accident. At Hach & Rose, we understand the immeasurable loss that follows the death of a loved one, and there is no reason that the bereaved family should suffer further losses as a result. Our compassionate New York accident attorneys are here for you 24/7 to any questions you may have concerning the loss of a family member. If you have lost a loved one in a New York workplace accident, please don’t hesitate to call 212-779-0057 today.